Additional activities: Within 30mins: New York Mets and LA Dodgers training camps (nice night of baseball), Treasure Coast Mall and Vero outlets. Within 1-2 hours is: Orlando/Disney, Epcot, MGM Studios, Sea World, Cape Kennedy, Space Coast, Daytona 500, cruise lines, Worth Avenue (West Palm), theater, and opera. Recreation Department has planned activities. So much to do; or just sit with cocktail in hand and watch the sunset from the beach or balcony. Local Agreement with Panther Woods Golf course. We began coming to Ocean Village with my father purchasing his condo in 1980. My husband and I have enjoyed Ocean Village for many years. With our having children and the realty market taking a dive; we were able to purchase our dream condo. We looked everywhere but no setting could match Ocean Village Resort. Ocean Village Resort has 120 acres and is very private. The main pool with it's Tiki Bar is fun. The resort has it's own restaurant with wonderful ocean views. Our enclosed garage has many fun things available for our renters. We have basic beach supplies with lots of chairs, umbrella, and a beach cart to make it easy for families. But....Feehan equals Fun!!! We also have: skimboards, boogie boards, razor scooters, skateboards, beach bikes, fishing poles, tennis, golf clubs (adult and child), and much more. Very large shower area in master bathroom and separate vanity area Guest bathroom has shower/tub. View the ocean, island, pool, and one hole of golf course from one of the two balconies! 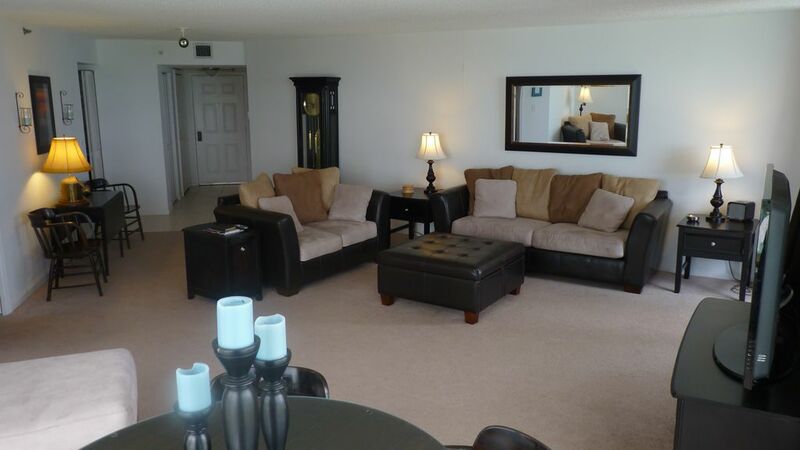 Condo has Southeast view of the ocean, island and intercoastal waterway. Enclosed garage with keypad or key entry. The condo has it's own internet with private password. Condo has bookcase, Cayman pool has several bookcases and Ocean Village has a library available to renters/residents. Pool table, found off the lobby, in the Community Room. Access to Ocean Village main pool and Cayman pool. Fantastic Time at Ocean Village! We had a wonderful time in Seascape! The condo was so spacious with two balconies - both with amazing views! We loved having coffee on the front balcony, watching the waves and spinners. We walked on the beach nearly every day and enjoyed the wonderful pool and hot tub. We golfed and even learned to play pickle ball! It was great having bikes, beach chairs, umbrella and even golf clubs to borrow from the unit. We can’t wait to return! We feel so lucky to have had such a wonderful home to enjoy our vacation! WHAT A VIEW! Jill and Matt’s 9th floor condo looks out over the mesmerizing ocean from 2 lanais and the great room. The kitchen was supplied with all we needed to cook our meals during our month-long stay. The beds were comfortable which is always important to us when we travel. This resort has the address of Ft. Pierce but is located over the bridge on Hutchinson Island. The beach is private and long and just a few steps from the condo building. We walked from the beach entrance heading north about 2 miles to the Ft. Pierce inlet and at least another 2 miles from the beach entrance area to the south. Jill and Matt have bikes available, beach chairs, umbrellas, golf clubs, etc. and a variety of water “toys”. There is a restaurant within the resort, but we didn’t take the opportunity to visit. The residents we talked with over our month stay were friendly, lovely people and that added to our experience. Jill and Matt were great to work with and were at the ready to answer questions and offer suggestions. If you enjoy an active (but not busy) resort community with all the amenities and miles of very private beach available I would recommend this condo! Absolutely perfect location. The apartment is very large and each bedroom has it's own bathroom and are on opposite sides of the apartment, which worked perfect when our son and his family came to visit over the holidays. Everyone had their own space when needed. The view of the ocean from the 9th. floor is beautiful with two screened in patios for reading and meals. The ocean is less then a football field to walk to the waters edge. Two of the three heated pools are no more then a few steps from the building entrance and the main pool is just a short stroll. Hutchinson Island is not as crowded as some of the other islands, a traffic jam would be about five cars yet there's enough fun restaurants on the island, or you can go off island to the mainland, no toll bridges. We went for walks along Ocean Drive almost every day and it was quite lovely. If your looking for a quiet, relaxing time, this would be a great place to consider. I have stayed at this lovely oceanfront condo several times now, and once again, it did not disappoint. The unit is so comfortable and well-appointed and the views from every room are amazing. When not eating out at the many very good local restaurants, we enjoyed having nearly every meal on the ocean front balconies. As usual, the beaches were clean and uncrowded and there were plenty of on-site activities to keep us occupied (including golf, tennis, pickleball, swimming and a well-equipped gym). This place is starting to feel like a home away from home and we hope to visit again soon. The owners are lovely people and it has been a pleasure renting from them over the years. We have been so very fortunate to have such wonderful renters such as Amy ! We are grateful and appreciative that we have renters returning year after year. I did not know what to expect when we began renting our condo. Nine years later I can say it has been a positive experience. It is my hope that our renters are happy with the condo and find the whole process an easy one. When you get a review like this...well, again I am so glad Amy and her family are leaving with good memories. What greater compliment could we ask for! The condo had amazing views and was very comfortable. We felt at home right away. We loved our stay in Ocean Village. There is so much to do there and Jill's garage was full of toys to help us enjoy our stay. There were bikes, roller blades, beach chairs, umbrellas, boogie boards just to name a few. Seascape came with its own private pool for the residents of the 3 Seascape buildings which was never crowded and lovely. But if we wanted a change we could also go to any of the other pools in the complex. The beach was also beautiful and never crowded. We loved our stay and can't wait to return again!! What a nice review but this is only because you couldn't ask for better renters! I live in New York and Sue was exceptional in her communication. It is my hope that when someone rents they have a good experience but when they appreciate what we are trying to offer and will be returning next year... well, this is a big part of why we do this. We've had a great vacation in Jill's condo and in Ocean Village Resort. The booking process was efficient even from Germany. Jill has asked well in advance if we would have any special wishes. So she povided us with a basektball for our kids. The condo is spacious, nicely and functional furnished and has a phantastic ocean view from balconies. Ocean Village is ver well maintained and offers a lot of sports oportunities, several pools and great beach. The whole family - 2 adults and our sons 22 and 25 - was all around very satisfied and we will surely come back! We may never get to Germany but it was wonderful to have a family from Germany come to our condo. I imagine there may be a little more concern traveling from a another country and unsure if it is what you hoped for. I am so very happy that this family enjoyed their stay and would like to return. We hope that they do! Ocean Village Resort is located on South Hutchinson Island of Fort Pierce, Florida. This is 30 mins. south of Vero Beach and just north of Jensen Beach of Port St. Lucie.